Future-proof mailing – Intelilink™ connects Secap’s AS125 to a secure server, via the internet, enabling services such as postal tariff changes, software updates and advertising slogans to be downloaded quickly and effortlessly. 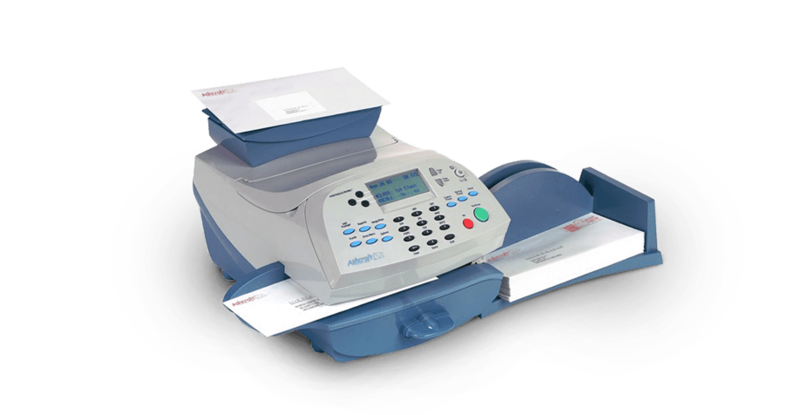 Correct value postage – every letter, every time – The AS125 incorporates a 2.5kg integral weighing platform, freeing up desk space and guaranteeing that each letter or package bears the correct postage value. Fast, accurate postage re-crediting – Replenish your meter 24-hours a day with simple one-touch refills via – quick, secure and hassle-free. Easy to use – All controls are fully integrated on one clear control panel with user-friendly instructions to guide the operator through each stage of processing mail. Streamlined processing – Efficiently frank and seal mail pieces up to 9.5mm thick, whilst larger mail is quickly processed with self adhesive tape strips. Mailing couldn’t be simpler with up to 5 presets for your most commonly used jobs. Monitor postal spend – Control postage costs with tracking and reporting for up to 25 named departmental or client accounts. Strengthen your brand – Enhance standard envelopes into eye-catching branded mail pieces with tailor made customised logos. Track incoming mail – Date and time stamping incoming post ensures mail is handled efficiently.